Your Excellency, these are words of one who offered himself for service to the people; words that emanate from the heart of a sincere Nigerian who sees everybody as having a part to play on our journey for change. Most of your colleague-politicians don’t see it that way, so millions are budgeted for spiritual journeys to Jerusalem, Saudia and Rome. This is aside from visits to shrines, tombs and ‘medicine’ men and even madmen within and beyond our borders all in an attempt to deceive God – praying to Him in ‘normal times’, seeking help everywhere during electioneering. Most of our politicians are neither Muslims nor Christians; polytheists will be nearer the mark. They believe in occultism and in every deity you can or cannot imagine, for the purposes of winning elections; to them everything is sacrificeable to appease their gods. Would that have explained the soaring cases of missing persons and children in election periods in this country? And what do you expect from a psyche nourished on selfishness and justification of any means that will produce the desired end of personal aggrandizement? My dear General, only those who seek public office for personal gains will bribe people to intercede God and false deities on their behalf to rule. This is the way of certain politicians especially that desperate clique that has vowed to rig elections and rule us for 60 years (noting that they did not say ‘lead’ us but rule us). Almost every voice is either compromised or coerced into silence. Men of God especially the big names of the Islamic faith in this country have bartered the passing comfort of this world at the price of their honour and the dictates of their calling. Politicians took advantage of the senility in some our sheikhs, bought them with ‘In God We Trust’, and made them cause dissention among the ranks of their flock in order to achieve disunity in their voting pattern. They also took advantage of the greed in others and paid a paltry fee for their discernment. It is unfortunate that religious leaders have debased their souls in shameless cupidity to such an extent that most of them are now part of our problems and not the impartial arbiters in times of crisis that they are supposed to be. What is more painful is the scorn and deep suspicion with which people look upon their instructors in faith who appear to confirm our worst fears as exegeses of religious texts are changed from their context to justify the clandestine agreement reached when that with which Allah’s words were sold was received. Another hitherto venerated institution, Your Excellency, is the palaces of their royal highnesses, which have been the repositories of our culture and heritage (I did not mention religion), but where people now visit in rage, not as litigants seeking for the emir’s just judgement, but to desecrate. If our royal fathers are seen to be partisan, are campaigning for the ruining party, are deserting their palaces to avoid receiving opposition candidates who come to pay homage and keeping mute when their subjects suffer neglect, destitution and illiteracy at the hands of political leaders, then people will put them in the same class as Muslim scholars who sold out to the power that be! It is pleasing to know that some of our royal fathers, in spite of intimidation, are still worth their weight in gold and are above board. At crisis periods you need a voice that commands people’s allegiance and respect. It is therefore, counterproductive to have everybody in tow – the ‘ulama and our royal fathers must be free of government control and influence; let them give their blessings to all that aspire to contest for any elective position, but they should not be seen to be partisan. Your Excellency, these committees and panels set up at federal and state levels with terms of reference to, among others, find ‘the immediate and remote causes’ of the post-election 2011 violence should be bold and honest enough to aver the truth. What was the cause of the crisis? Was it a planned operation hatched by some opposition politician months before the elections, or was it a spontaneous reaction to the declaration of cooked results at collation centres that did not resemble what was declared at the polling units? Ringim, the repository of civil law and order, seems to share the feelings of all who truly saw, and not just got spoon fed through the partisan press, that the mayhem was spontaneous in origin but premeditated in perpetuity (our Nobel recipient on the other hand, who seems to always forget that his award was for his works in literature, and thus considers himself the pre-eminent authority on every subject, was also quick to join the blame wagon). And if, the latter is the case, the committee and panel members will do a great service to this nation by recommending punishment not only for the miscreants who killed innocent people and burnt places of worship, they should include the riggers of elections, regardless of which party they may belong to, who stirred up people’s fury in the first place. After all, even the law is lenient with a man who kills a man he caught desecrating their matrimonial bed with his wife. They must also show that one life is not more or less precious than the other. An estimated 500 people died in the aftermath of the electoral frauds in Kaduna alone, but only 9 people received nationwide coverage. They were not the only ones whose parents paid for their education; they were a small fraction of the graduates and family bread-winners whose lives were wasted by those who profess both religions. The silence of the press in not reporting the larger and more sinister carnage smacks of complicity or assent. Many of these died ‘more’ innocently than some of the corps members; for indeed, we have since learnt that some of these corps members, while not deserving to die, were deserving of imprisonment for their part in rigging the last elections to high heavens! Everybody knows the real cause of this crisis, and that you are absolved of any blame, but somehow, there should a scapegoat, since they could not pin anything on you after your International Conference Centre challenge where you said: “I have had the fortune and privilege of managing national resources in various capacities—as a military commander, as a state governor, as a minister, as head of the Petroleum Trust Fund, and as the head of state of this great country. 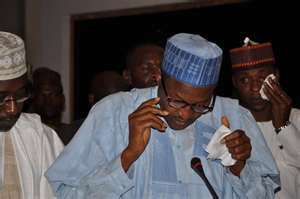 And in all that I have been and done, I have never touched a kobo of public funds. In the axis “of rascals”, to use the uncouth words of the Fedora, why were elections not rigged in favour of the ruining party in the NASS and governorship elections? A nocturnal agreement had to be reached for the presidential elections so that miscreants could neglect their arms to allow a different kind of miscreants to rig for the consensus candidate. Well, after all the scheming, night and day, the two parties have gone into strife for the division of the booty. You would think they were united, but their hearts are divided. The point is, miscreants, Your Excellency, in other parts of the country serve the purpose of protective armour to ward off any attempt to steal people’s mandate; in your catchment area they are a shepherdless herd, hence the spree and fear elections – money everywhere to buy people; rigging was made easier with a dusk to dawn curfew. God is watching! Any hope in the tribunals, Your Excellency, as you have trod this path many times in the past? The only difference now is that your party is appearing and not you in person. If what we read in the papers concerning INEC’s attempt to frustrate CPC by not producing electoral material evidence is anything to go by, I don’t entertain any hope. There is only a very thin line between Jega and Iwu, unfortunately. This is the time to prove that Jega’s DDCs were worth the expenditure their purchase caused the tax payer and the trouble we were made to go through to capture our finger prints. Now is the time to use the data captured to expose multiple voting and ballot paper stuffing if INEC will be allowed to cooperate with the opposition parties at the tribunals. Your Excellency, zoning has returned to the ruining party now that it is convenient to zone offices. They discarded it when the Fedora coerced them into adopting him as candidate. He hounded your erstwhile friend and foe, the gap-toothed wordsmith, into submission and bought all the ‘buyables’. I have never seen that much money exchange hands because of any candidate. I had cause to ponder over the implication of so much spending to win the votes of people whom they claim naturally voted for Fedora and all that kept gnawing at my mind is ‘return on investment’. I may be wrong, but I want to believe that so much money exchanging hands can never be for altruistic reasons. I fear that those that closed the door of zoning, the most effective tool to checkmate tribal dominance and subjugation, may have inadvertently opened the door that the architects of our constitution had fastened. I mean the provision for Federal character and the concept of geopolitical calculations in office-sharing. They may have loosened the shackles that have kept the most dominant groups in this nation in check. It is said that there is honour even among thieves; being the only thing they can call their own, but even that has gone to the dogs now. Mai Gaskiya, I have never met you, but I know that I will get messages saying I am your paid agent or that I want your patronage. I also know that some will say that I am a ‘fake malam’. Some, like the ones I got after my last article, will even call me a fool. You will read all the garbage and good words I am sure to get in response to this correspondence when they come, insha Allah. I will not mind them in the least as long as they do not refute my words and facts. I will examine any refutation of any fact I get and see if it merits an answer. In Nigeria, we usually kill the messenger and ignore the message.